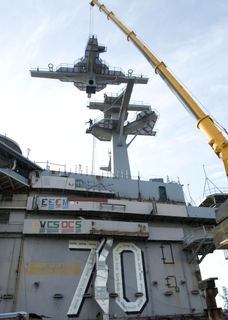 NEWPORT NEWS, Va., Feb. 22, 2007 (PRIME NEWSWIRE) -- Northrop Grumman Corporation (NYSE:NOC) completed a significant work performance milestone on the Nimitz-class aircraft carrier USS Carl Vinson (CVN 70) with the installation of the final section of the ship's main mast on Feb. 21. The carrier is undergoing a refueling and complex overhaul (RCOH) at the company's Newport News sector, the nation's sole designer, builder and refueler of nuclear-powered aircraft carriers. An important aspect of this availability includes modernizing the ship's island with the latest technology and installing a new main mast. "Our combat systems team accomplished this work on schedule with a sense of pride and commitment," said Jerry Howlett, Northrop Grumman Newport News construction superintendent for the CVN 70 program. "Achieving this key event positions us for future successes during the RCOH." The 70-ton structure provides a platform for radar and communication systems high above the ship for maximum coverage. During refurbishment, the original round mast pole was removed and replaced with a modified, tapered square pole to increase strength and keep electrical and piping systems enclosed for survivability purposes. It is also larger, which allows for waist-high safety rails and easier access to all areas by internal ladders. USS Carl Vinson's new main mast is similar to what was installed on George H. W. Bush (CVN 77), the newest Nimitz carrier under construction. "Accomplishing this last major topside construction milestone before our undocking later this year is a truly exciting milestone, and a further demonstration of the success Team Vinson has had thus far in keeping our challenging overhaul on schedule," said Capt. Ted Carter, commanding officer of Carl Vinson. "Achievement of this milestone also sets us up for our mast re-stepping ceremony on March 6, which will be an important, traditional step in Carl Vinson's ongoing return to 'life.'" The removal and reconfiguration of the island structure and main mast began shortly after the ship arrived on Nov. 11, 2005. The USS Carl Vinson is undergoing its refueling and complex overhaul at Northrop Grumman's Newport News sector. The project is scheduled to last more than three years and will be the ship's one and only refueling and complex overhaul in a 50-year life span. Vinson is the third ship of the Nimitz class to undergo this major life-cycle milestone.